I stepped onboard with a sense of wonder. To think such a vessel could travel the world. I imagined the sails filled with the wind and the salty water crashing against the bow. I looked up, the ropes pointing to the clear, blue, infinite, sky. As far as the eye could see, blue was all there was to behold, bright, jolly blue. I felt small standing there, a vast world of possibilities opening up before me. Closing my eyes for just a moment I imagined all the places we could go. How far, how many! We never left the quayside, yet the ship held within it a sense of adventure that was highly contagious. As soon as you set foot on the gangway, that feeling wrapped itself around you and wouldn’t let you go. At that moment I could have been persuaded to leave everything and set out on an adventure across the sea. In fact, I later found out that this was more plausible than I had originally thought, thanks to a trainee program provided by the Foundation in charge of the ships’ upkeep. Even now, the magic hasn’t faded. I’ve been flicking through my photos and imagining what sailing on one of those ships must feel like. 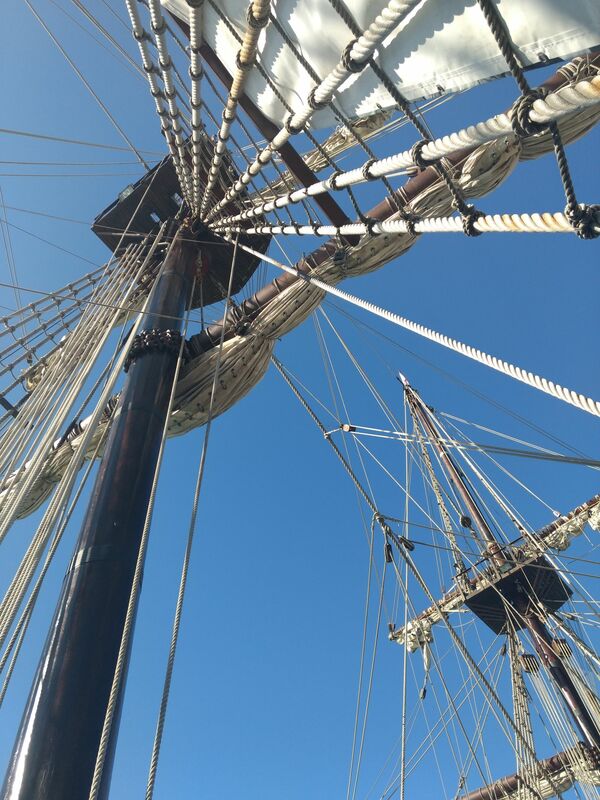 Nevermind the fact I get quite seasick, staring up at those historic vessels makes me want to hop onboard and set sail tomorrow. It’s a highly romantic thought, one that doesn’t factor in the hard work sailing requires. Nor does it consider any other practical aspect involved. But there is nothing wrong with dreaming, in seeking out the adventure. 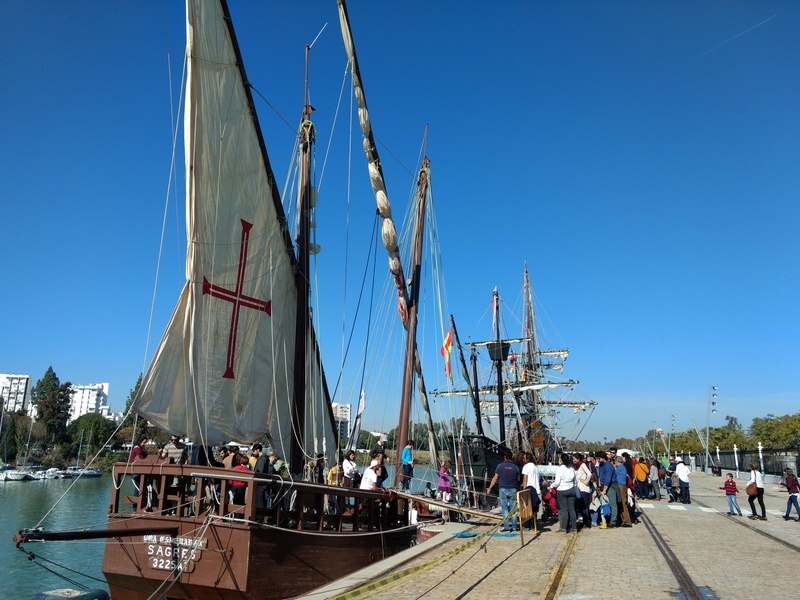 It was an ordinary Saturday morning when I went in search of the Galeón Andalucía, Nao Victoria and Caravela Boa Esperança. I found them at Muelle de las Delicias and they were quite a majestic sight, standing tall in the November sunshine. It appeared I wasn’t the only one to show up for the event, however, and the mass of people busily strolling along the docks that morning persuaded me it would be better to return later in the week. But I couldn’t stay away, I was way too excited. So, instead, I went for a bit of a walk in the nearby María Luisa Park and ended up visiting the Museo de artes y costumbres populares, a story for another day, perhaps. Then, around lunchtime, when most people had headed home, I returned to the ships. Now I had the place almost to myself and there was no waiting around. I was able to explore freely and at my own pace. 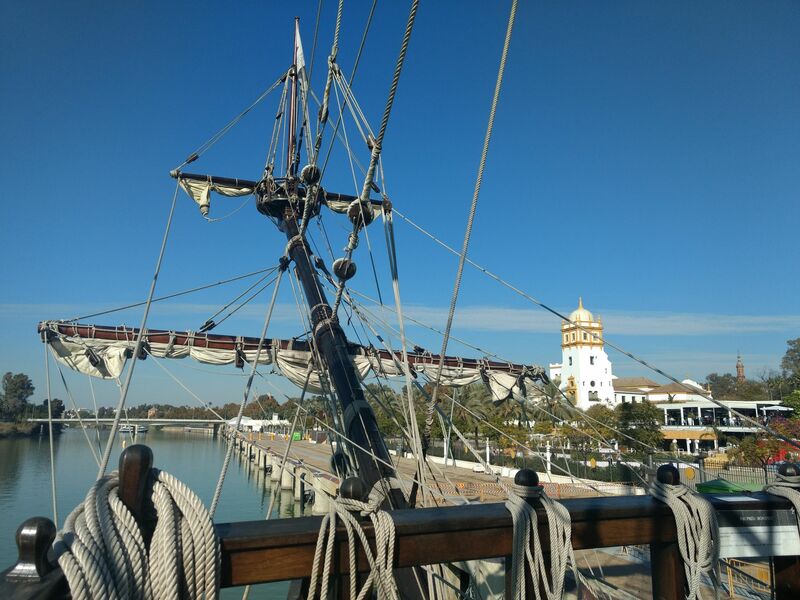 The Nao Victoria is a replica of one of the ships that sailed around the globe between 1519 and 1522. Juan Sebastián Elcano became the captain, achieving the feat for the first time in history. 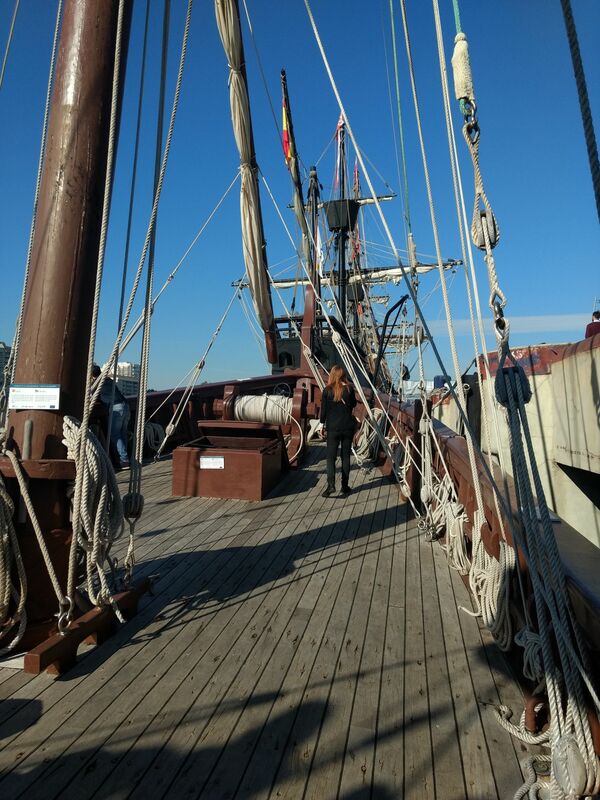 The replica repeated the voyage in 2004 and showed just what that first crew had endured and achieved, and in doing so, Nao Victoria became the first historical replica to circumnavigate the globe. I wish I had had a chance to talk to the crew more. Nevertheless, there was plenty of info available on the ships themselves and I did overhear a couple of conversations. The ship was commissioned for Expo 92, linked also to the commemoration of the 500th anniversary of the “discovery” of America. Apparently, on launching Nao Victoria for the first time the ship capsized with Curro, the famous colourful Expo mascot, onboard. Happily the crew and Curro were all rescued and the ship recovered. Now, 25 years later, it sails around the coast docking at many ports to allow people to learn more about the history behind these impressive vessels. I had a great time looking around the ships. But adventure can also be found in the everyday details. It all depends on how you look at what lies ahead. What can you see around you? Not exciting enough? Change your perspective and add a little spark to your routine. Let’s go in search of adventure! Where have you encountered adventure lately? “adventure can also be found in the everyday details“, ¡qué gran verdad! I so agree, living in a spirit of adventure can make even everyday details stand out.